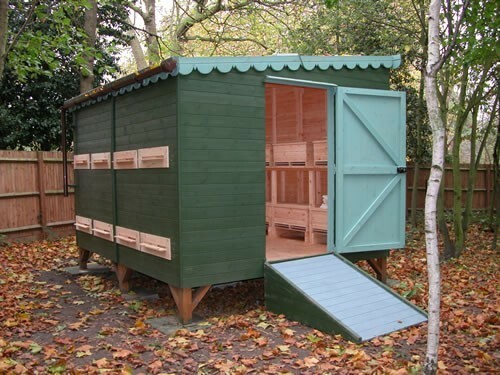 We are able to provide installation for all of our garden buildings across the UK, please call us on 01604 586939 for a quote on your chosen building. This project has been extremely rewarding and is now taking up a great deal of our manufacturing time as we are receiving several orders for both the building and our external bee hives. This building was initial experimental and is based in Finsbury park, London. It was funded by an agency charged with looking into the countries policy in keeping bees. 99% of all bee in the UK are kept solely by amateurs and bee keeping generally is on the decline. This is obviously very concerning to the government as bee pollination contributes greatly to the countries economy. Research has been ongoing for the past two years and we have been involved now for over 9 months, several prototypes have been made and we have now finalised the design for all the three areas: the building, internal hives and external beehives. An environmentally friendly structure - all the wood that Taylors use is from sustainable sources and we only use suppliers who can supply a chain of custody certificate. The building had to be rot free and allow good ventilation - we employed the Walter Segal principle and have raised the building on stilts to ensure an even air flow around the building, should rot occur all is needed is to replace the feet themselves. This system is now quite popular in our products and we are presently building a scout hut on National Trust property using this principle. As well as the obvious benefit of reducing the likely hood of rot is the fact that the ground is not disturbed unduly still allowing good drainage. Security and lighting - The building is clad in very substantial 22mm cladding on a 2"x2" and 3"x2" framing with a fully framed, ledged and braced door with 5 lever mortise locks. Instead of windows we have introduced Perspex skylights with outward ventilation areas for bees to escape should they enter the building. We have also installed a solar panel on the roof to run a small internal light for use in the evenings. 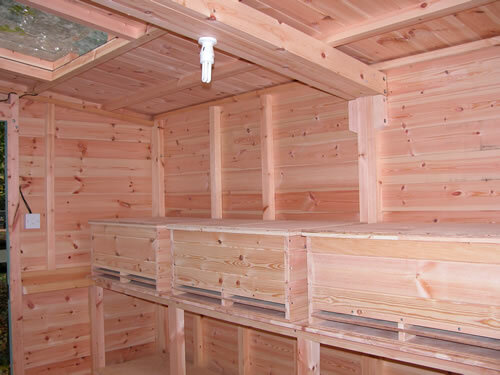 The hives themselves are made from the same cladding as the building and in fact in most cases are off cuts from our main manufacturing process for our sheds, this in turn reduces the costs considerably and again is environmentally friendly due to the recycling of a product that would normally be destroyed. Easily manageable and operated by the elderly, children and the disabled - one of the main problems of present day bee keeping is the lifting of "supers"
To increase honey production - The beehive works on a horizontal plane rather than in present day hives which are vertical. This allows harvesting of honey right from the beginning of the season. These beehives accommodate all the standard size combs available today but we are experimenting with plastic combs and preformed beeswax combs. Bee Space - considerable research has taken place into the areas bee prefer most the hives themselves were manufactured to quite tight tolerances. Cleanliness - our structure can be separated from the floor area for a seasonal clean if necessary to gain access to the varoa mesh below, for every day cleaning it has a pull out tray below the mesh. Combs - this beehive will accept ten combs in each compartment separated by a queen excluder. 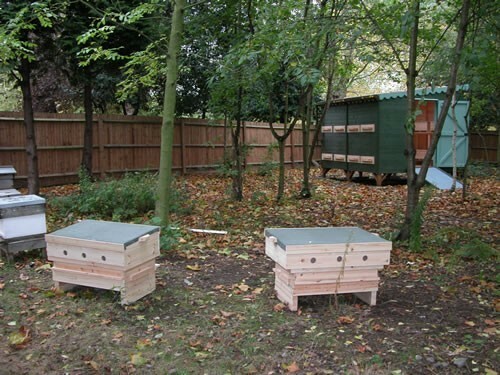 Once it was realised the success of the internal hives we were asked to produce an external version, again keeping in mind access for the disabled and young. 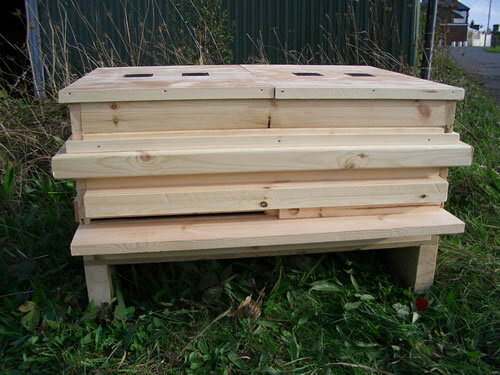 This model has proved to be very desirable and is certainly different from the standard hives. 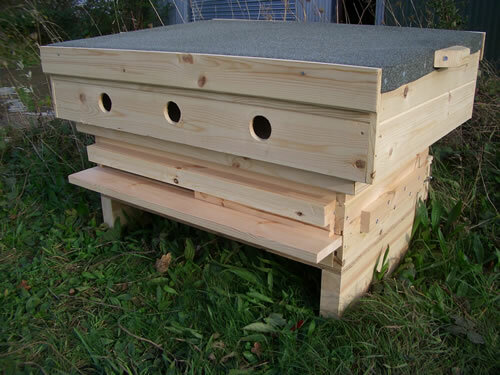 Although this beehive is not available in our catalogue yet it is available for sale to those who are interested. External ventilation guarded by mesh - ventilation for our hive works on a vertical mushroom effect, air travels through the hive and then rolls down the inner of the lid reaching a ledge and venting through the side. Bee entrance with landing ledge, the entrance itself has a sliding door which can be made as small or large as required. 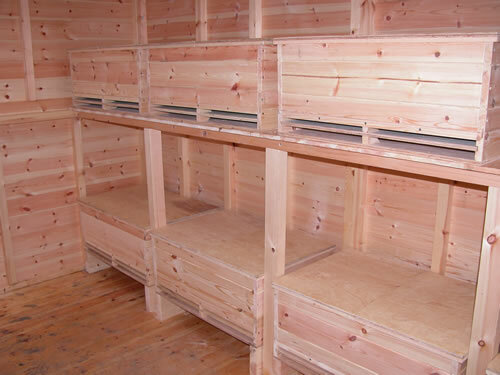 Fold down flap, protected from the weather which gains access to the pull out tray, in summer months this can also be left down to increase ventilation helping to control the temperature in the hive. Stand - this can be at any height as required. This picture shows the ventilation holes, bee entrance with sliding door and landing ledge. Showing the weather proof lid removed to gain access to the crown lid. 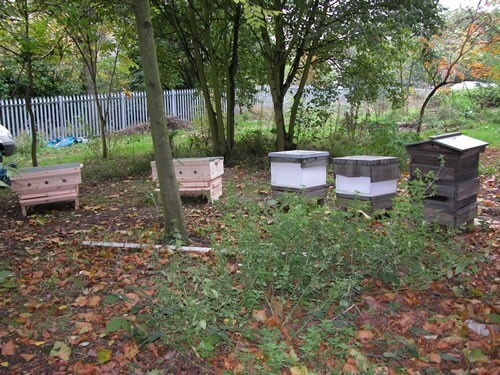 Our hives being tested against traditional hives at Finsbury.